Update : Now you can use only Rs.100 of your total wallet money on each order. 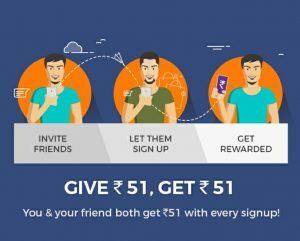 Voonik app is giving Rs.51 on signup and Rs.51 for referring every friend, wallet is 100% usable so if you do approx 10 refers you can get a cool tee of Rs.500 for free. Mr. Voonik is a big clothing company for men, there are more than 2000 sellers on this website. Shop from Levi’s, Zafraa, Jockey, Lee, Pepe Jeans, Spykar, Raymond, Police, Tommy Hilfiger, Titan, Fast Track, Puma, Mr Button and much more international brands in a single checkout. Shop for clothes that suit your body shape, color choice & style. Free personal stylist in the app. Now you just need to open the app once you complete downloading the app. On every successful referral you will get Rs.51 in your voonik wallet which you can use to purchase items from voonik app. 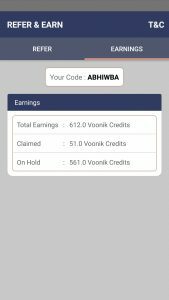 Voonik Cash is on hold once you complete a refer, its on hold because they will verify your refer under certain conditions and once they find everthing good, they will approve your referrral and then you can claim your referral reward to purchase anything from the app. iii. The Referrer shall be able to redeem the points gained in sub-clause (ii) above within one hour of successful sign up. These points shall remain “on hold” throughout that time period. 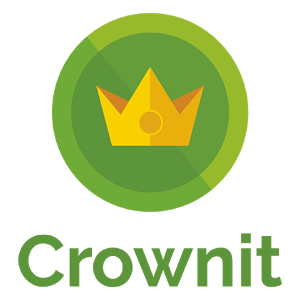 • Neither the Referrer nor the Invitee should install the App using App Runtime for Chrome, Emulators or Simulators. 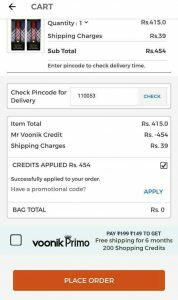 MYNTRA MEGA SALE – EVERYTHING AT 50-80% DISCOUNT + 10% HDFC DISCOUNT + 10% CASHBACK + Rs.25 SIGN-UP BONUS! Proudly owned by Abhishek Mittal!